Ms. Haynes kind nature is immediately apparent when she walks into a room. “I enjoy getting to know my patients personally and treat them as I would a family member”. Lana has a true calling for dermatology. 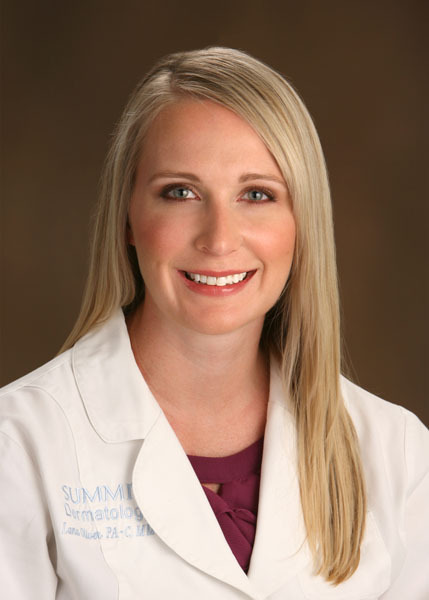 She left a family practice position in Stuttgart, Germany in 2012 to join Summit and continued her training in dermatology under the leadership of Joseph Huppmann, MD. As a Physician Assistant in dermatology, Lana is qualified to perform examinations, diagnose, treat, and prescribe appropriate medical therapy for dermatologic needs. She is skilled in performing procedures to include cryotherapy, electrodessication, shave biopsies, punch biopsies, extractions, intralesional steroid injections, and excisions, as well as various cosmetic procedures including injectables. She has a special interest in educating patients on skin cancer prevention. Ms. Haynes obtained her Physician Assistant Master’s Degree from Methodist University in North Carolina. She practiced for two years in rural Pender County before leaving to work at Stuttgart Army Health Center in 2009. Ms. Haynes returned to her North Carolina roots and joined the Summit staff in 2011. Ms. Haynes is a member of the American Academy of Physician Assistants (AAPA), the Society of Dermatology Physician Assistants (SDPA), the North Carolina Medical Society (NCMS) and the North Carolina Dermatology Association (NCDA). She is ACLS and BLS certified. Lana enjoys spending time with her white German shepherd Lola, paddleboarding, working out, and traveling.